I bought the Navigator because I wanted a full-size SUV that had fold-flat rear seats. I could not find a used Expedition in good condition, so I bought the cheapest Navigator I could find in a dealer lot. I have been, surprisingly, very pleased with the Navigator's utility, costs and comfort. 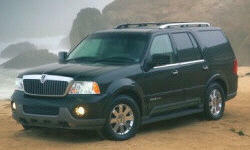 Why the 2005 Lincoln Navigator? The Navigator's IRS gives enough room for the rear seats to fold down flat. This is a huge advantage, in my opinion, over the GM offerings which require you to remove the rear seat completely to load bulky items. As a homeowner and a landlord, I use this capability quite frequently. The Navigator has swallowed (at various times) full size hot water heaters, a 9 foot Christmas tree, countless bags of mulch and a lawn mower. The driver's seat is exceedingly comfortable. Its heating and cooling features work quickly and effectively. The adjustable lumbar support is in the right place to be effective without being intrusive, and the large cushion effectively supports the my legs. As an athlete who is almost always sore or injured, I very much appreciate that the seat is high enough off the floor that my lower legs are reasonably vertical. I came to the Navigator after having owned (in no particular order) 2 BMWs, a 964-series Porsche, an MKIII Golf, and a 1st gen Jeep GC. Being something of a Euro-snob at the time, I approached the Navigator with some contempt. To my surprise, the Navigator has been almost trouble free, with only a single repair ($500) in the 50K miles I have driven it. I bought it because the price was right and I needed a full size SUV. The previous owner and his kids had abused the interior and it smelled awful, so I expected a lot of problems. I have been pleasantly surprised with the low operating costs. Why Not the 2005 Lincoln Navigator? I typically average 15-16 MPG in mixed suburban, highway, urban driving, with a 2 hour round-trip stop and go commute. While this is not bad, it is not good either. Even so, I have read several forums where Navigator owners complain about getting 12-13 MPG in mixed driving. I think they must be really stomping on it. The newer Navigators run on 87 octane but mine requires 91 to run properly, which really means that I have to fill it with 93 since no one sells 91 where I live. I have never found the power delivery to be inadequate, but the engine is loud and ugly-sounding under hard acceleration. The engine/transmission combination also behaves strangely between 1st and 2d gears causing an alarming lurch if I do not press the accelerator smoothly enough. The seating material is excellent, but the silver-painted plastic that covers most of the forward-facing dash and control console is awful. My gas mileage on my 2005 Navigator is around 12.5-13.0 in town and around 14.5 on the highway. Terrible. I've had it tuned up and "puttered" with, trying to get mileage up, all to no avail. I'm not heavy footed, but I do find that the 80mph highway speeds here in some parts of Texas make tha Navi drink gas much faster. However, it is a wonderful ride that we will not be getting rid of any time soon. I am, however, to see the price of gasoline coming down!